Emissions from hospital cooling are on par with the annual climate pollution of 75 million cars. Fortunately, sustainable cooling solutions that can slash emissions, reduce healthcare costs, and maintain patient care are readily available. 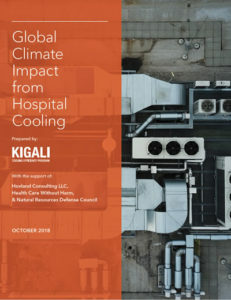 This report—prepared by the Kigali Cooling Efficiency Program and co-authored by Hovland Consulting LLC and Health Care Without Harm with input from the Natural Resources Defense Council—analyzes the significant and rising climate impact from hospital cooling and recommends actions to reduce these emissions. Readily available solutions to reduce hospital cooling emissions without compromising patient care and also reduce healthcare costs.